ID: Very similar to E.atrella and Aproaerema anthyllidella. All web images show E.atrella with, and E.immaculatella without, a distinct pale tornal spot; however this feature is not used in the key in MBGBI4.2 and may be variable in both species. The tornus of E.immaculatella is described as usually "showing a few yellowish white scales". 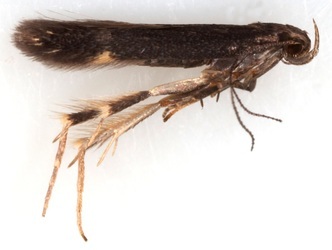 The key uses features of the labial palps "ochreous" in E.atrella and "greyish or yellowish white above and at sides, lower edge dark fuscous" in E.immaculatella (supporting the identification of specimen §1). 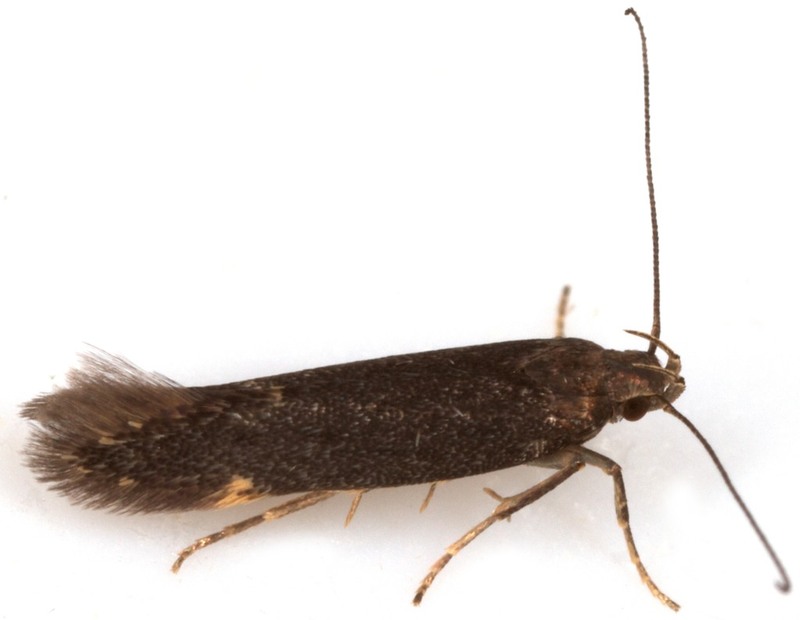 A wider size range is quoted for E.immaculatella (ws 8-13mm) than for E.atrella (11-13mm) so that small specimens (fw<5.0mm) should be E.immaculatella. 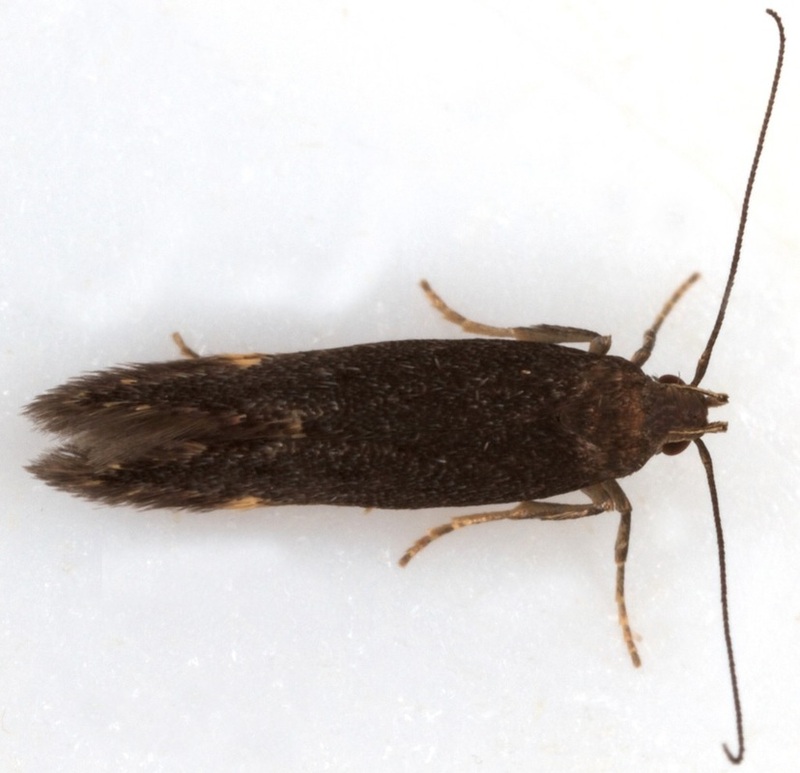 E.immaculatella also has a longer flight period from May to Sep, while E.atrella is only found in Jul-Aug.
A.anthyllidella is distinguished in MBGBI4.2 on features of the the antennal scape "lined buffish fuscous anteriorly" - however in specimen §1 there does seem to be some buff colour on the antennal scape so I doubt that this can be used as a reliable feature. 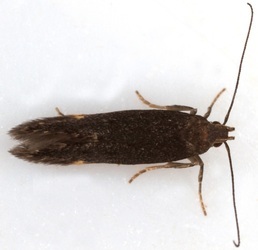 The antennal flagellum is entirely dark fuscous in both Eulamprotes species while in Aproaerema it is ringed buff at least in the basal portion - this seems to provide a more reliable distinction. The forewing of Aproaerema shows a dark line around the apex, though this may be lost or less distinct with wear; there is no such line in the Eulamprotes species. In the male, the genitalia protrude from the abdomen in Aproaerema but are completely withdrawn in Eulamprotes. Male genitalia: Aproaerema is readily separable - it has a well-developed bilobed uncus and a narrow aedeagus. Drawings in MBGBI4.2 (figs 2c & 2d) show the main difference between E.atrella/immaculatella as being the arrangement of minute cornuti near the apex of the aedeagus. In E.atrella this is drawn as a patch of numerous overlapping relatively large cornuti; in E.immaculatella the cornuti are much smaller (~1/6 the length of those in E.atrella) and positioned in rows that do not overlap. (The cornuti of specimen §1 were too small to be seen at 80x magnification using my stereo microscope, while those of E.atrella were readily visible at this magnification). 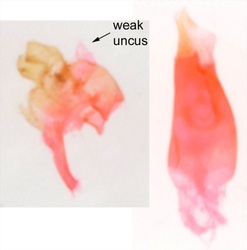 It is unclear whether other apparent differences between the male genitalia of these two species in the drawings in MBGBI4.2 and in the images at dissection group, represent a genuine means of distinction between the species. The aedeagus of E.atrella is drawn with an elongate-ovoid weakly sclerotised area in the tunica, this appearance is also seen in images of E.atrella at dissection group and in my images of specimen §1. 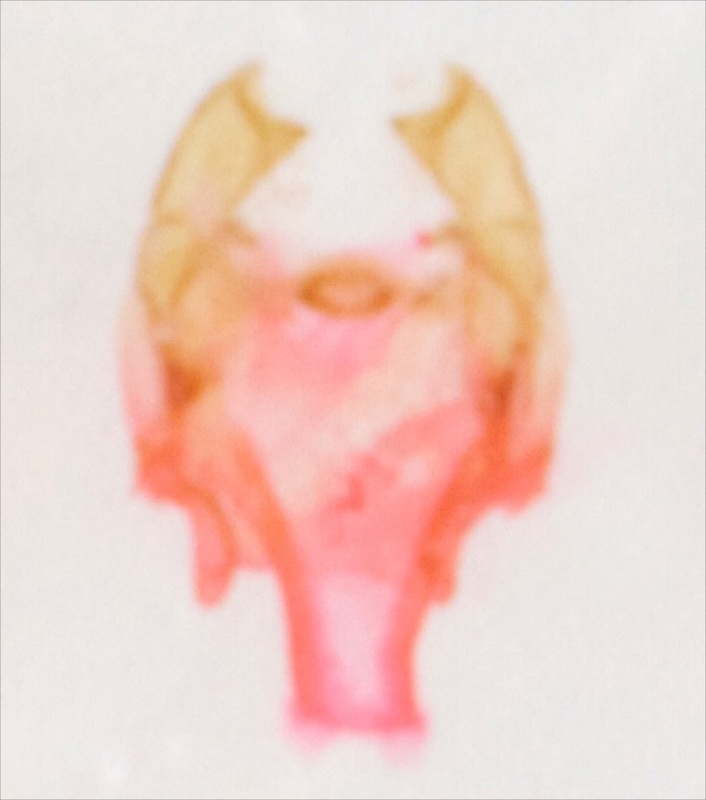 It is not shown in the MBGBI4.2 drawing of E.immaculatella or in the image of E.immaculatella at dissection group, though the latter is in lateral view and the area in question may not be visible in this view. Dissection group labels the vinculum of E.atrella as being broad, but shows that of E.immauculatella in lateral view, so that no meaningful comparison is possible. The drawings in MBGBI4.2 show E.immaculatella with a short triangular vinculum while E.atrella has an elongate broad vinculum. The images at dissection group show the vinculum to be a similar length in both species.